This powerful, Pulitzer- and Tony-winning play is filled with humor and compassion and touched with poetry. A wealthy middle-aged couple has their complacency shattered when longtime friends appear at their doorstep claiming an encroaching, nameless "fear" has forced them from their own home. Their arrival sets off a firestorm of doubt, recrimination and ultimately solace, upsetting the "delicate balance." Enjoy This classic play at Silver Spring Stage. "...Fred Zirm has done an excellent job as director. The actors navigate around each other and the stage perfectly, while using every inch of the set. They hit the emotional moments head on, as well as the comic ones. Everything comes together for an evening of enthralling, intimate theater. Be sure to catch it!" 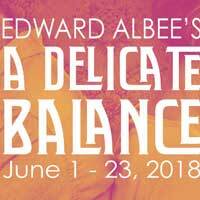 "...With Fred Zirm's mounting of "A Delicate Balance," Silver Spring Stage has created a very good production of a very odd play."